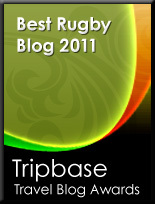 TOTAL FLANKER...a rugby blog: Deano backs me up! As well as a debilitating lack of pace it seems that I have more in common with legendary English number 8 Dean Richards (pictured in a pose that I found myself adopting on a regular basis throughout my comeback match three weeks ago). You see, Deano agrees with my disgust at the decisions of Lawrence Dallaglio and Mike Catt to go public with their criticisms of Brian Ashton. Dallaglio's autobiography is being serialised in the Sunday Times, whilst extracts from Catt's book were published in this weekend's Mail on Sunday. "I find it very disturbing that players are coming out and slating Brian" Deano has said. "I think it's absolutely disgraceful. These guys should never play for England again. Everybody has reasons on occasion to criticise coaches but the unwritten rule in rugby is that you don't criticise each other in the press. It's an absolute disgrace." The problem is, Deano, that "these guys" have no intention of playing for England again and clearly don't care what effect their public criticisms might have on morale. Catt has announced his international retirement while even someone as self-deluded as Dallaglio must realise that he hasn't a hope of playing for England again based on his performances at the World Cup. I accept that these guys have books to sell, but I am dismayed by their lack of loyalty to a man who resurrected their international careers by including them both in a squad ahead of arguably more deserving players. The proper forum for any criticisms of the World Cup campaign, at this stage, is the review being carried out by the RFU, not in the Sunday papers.